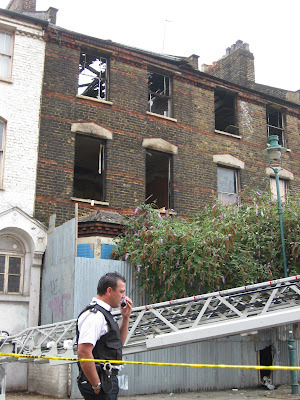 Last night the ninth major fire in Dalston over the last four years burnt out yet another of our old houses. This was Ashwin Street, Dalston, yesterday morning (with the cranes which are building New Dalston's towerblocks in the background). Sealed off, fire engines and police. The Ashwin Street 1860's Victorian terrace had been abandoned by the owner and left tinned up and increasingly derelict very many years ago. Even squatters had given up on the houses when roofs started falling in. Conversation yesterday morning - Fireman at the scene: "I'm 100% there was no electric or gas on. Must have been a naked flame"
Policeman: "Someone jumped from the house and had to be taken to hospital"
This afternoon the street remained sealed off. Contractors were on site. Conversation yesterday afternoon with policewoman at the scene: "We asked the Council who owns it. They say its nothing to do with them. They don't know"
An architectural historian had expressed delight in the corner site (white) building following a recent informal inspection before the fire. She suggested a structural survey would identify whether the facades of the rest of the terrace could be retained to preserve its setting. 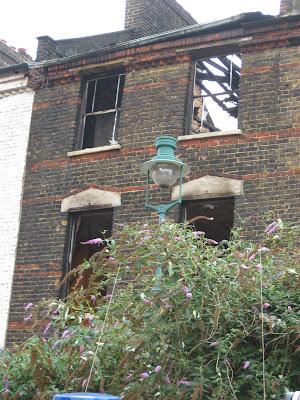 Will Hackney bother with a survey or just bulldoze the whole terrace of old houses? Conversation yesterday evening with policeman on site: "Hackney now say they own the building. One puff of wind, they say, and it'll collapse. They've been telling us for years they were going to demolish. Its all dodgy.Now they can go ahead." In the 2005 public consultations OPEN proposed that the Ashwin Street terrace could be converted for affordable studios and small business units as part of a Dalston cultural quarter, linking the new Gillett Square and the now demolished Dalston Theatre and Georgian houses on Dalston Lane. The Council didn't respond to these proposals. This year the street was designated as an "opportunity site" in the Council's draft Dalston Area Action Plan. The "opportunity" wasn't explained further. 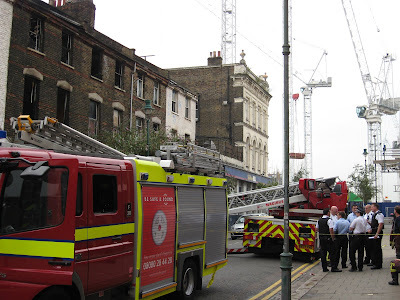 All of Dalston's nine major fires have been on sites the subject of redevelopment proposals. These have included the Council's own housing office in Rosebery Place which burnt down in May 2005 just behind Old Dalston's Theatre. 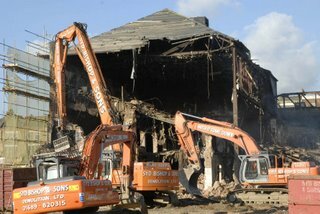 The previous month a contract had been prepared for the demolition of the Theatre which identified the need for hardstanding to place demolition equipment. The building slab, once the the burnt out Council offices had been demolished, proved ideal. A happy accident, serendipity, one might say. Conversation this morning with a policewoman: "I would have expected to have heard about the person who jumped from the window - you know, that they're OK."
Four Georgian houses have been burnt out by fires in Dalston Lane. The Council had auctioned off the terrace to an absentee slum landlord in 2002. 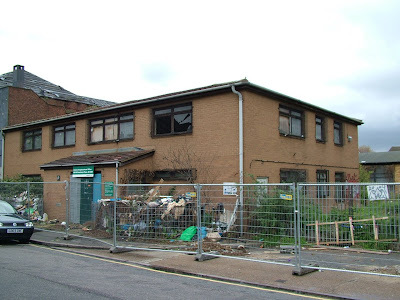 In July 2004 a major fire completely destroyed 74 Dalston Lane (Dismop) the vacant building next to the Star Bakery which was facing possession proceedings. A temporary roof covering was provided but, during a period of high winds some weeks later, this roof blew off and landed in Dalston Lane, a major bus route. A later fire destroyed the house next to the Ganges restaurant which has since suffered serious water penetration and structural damage. 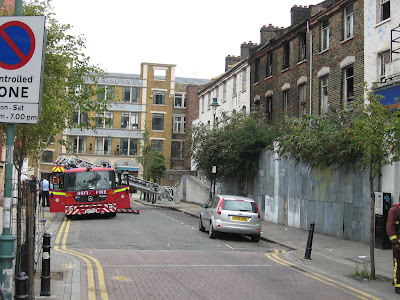 The houses at 62-64 Dalston Lane were the subject of a planning appeal when in September 2004 fires occurred there after permission for demolition had been refused. A man had to jump for his life from the front windows - he'd been visited a few days earlier and warned to get out. The Council continued to talk about its heritage policies but did nothing for four years until recently when it demolished three of the houses because their structural stability had finally failed. We live surrounded by dereliction and decay. We can take little pride in our environment and where we are from. The Council's deliberate neglect of our historic town centre may soon lead to the remnants of its once thriving local economy and fabric being lost forever. A cloud of suspicion hangs over Dalston.